Karra Yerta Wines - Barossa Ranges Ramblings & Reviews: The importance of being earnest. Our wines are now all sold. Thank you valued customers, for your support over many years. The importance of being earnest. This blog post was originally written for, and published on "Barossa Dirt - True tales and twisted vines" in September 2010.
ear·nest 2 (ûrnst) n. 2. A token of something to come; a promise or an assurance. The name ‘Barossa’ is quite well-known, and its adjacent GI, Eden Valley, despite having some rare, very old vineyards, could be considered one of the new kids on the block as far as global public recognition goes. But somewhere in between these amazingly beautiful, yet different GI’s is a secret sub-region. Despite a variable grape production since the 1860’s (starting with currants being grown), it is only in the very recent past that Flaxman’s Valley has begun to emerge publicly as the quiet, mysterious, yet stunning and very special wine-producing place that I have been fortunate enough to live in since 1985. A special ridge exists in the northern part of Flaxman’s Valley. It stretches from Bob and Wilma McLean’s property on the northern tip (the McLean’s property was one of my ancestors original homesteads), to the southern tip where the famous Heggies and Pewsey Vale vineyards lie. This ridge is bordered by the Kaiser Stuhl Conservation Park, with the Tanunda Creek weaving a well-worn path through properties and park alike as it heads to the west, down Menglers Hill to meet the Para River. In between these two tips are the miniscule settlements of Randall-Town and Argent-Town, aptly named after the families that settled there in the early 1900’s. The Randall families planted vines and fruit trees on settlement. They worked the vineyards passionately for numerous decades. A kilometre to the south, the Argent families did the same thing. The old vines tended by the Randall families by hand, are now the grapes behind the Ringland Vintners, Hobbs Vintners and Karra Yerta Wines brands. Further to the south, the remaining Argent vineyard provides the bulk of the Flaxman Wines portfolio. Vineyards planted by my own ancestors existed on the (now) McLean’s property until the vine-pull scheme of the eighties (the previous owners pulled out the precious old vines). Bob and Wilma McLean have since replanted, thankfully. The wines that are produced from this ridge are incredibly special, and as there is not a mains water supply at all in the area, even for housing, most of the vineyards are dry-grown aside from the very rare watering in major heat-waves by irrigation from small dams or bores. 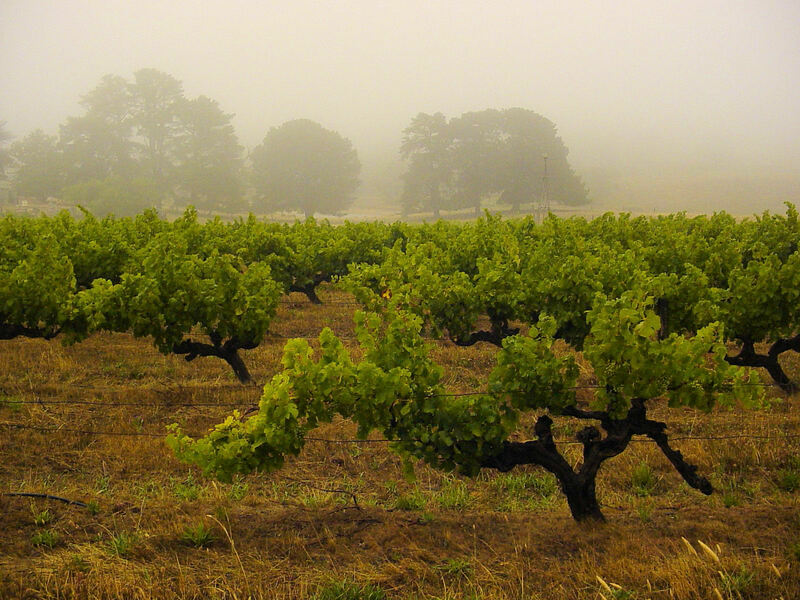 Irrigation is not a major part of the care-taking of these vineyards as the region itself has a very high rainfall average (around twenty-eight inches). Most of the vines are so old and deep-rooted that they seem to fare very well in the extremes of the South Australian summers. Not to forget that while the Barossa Valley floor sizzles, it is usually at least a few degrees cooler in the Barossa Ranges. On forty-five degrees celcius days, that can make a huge difference to survival of canopies, and subsequent grape protection from the elements. But there are always exceptions to the rule of a hot, dry, Barossan summer. In January 2007 we had almost two inches of gentle rain which made for an exceptional vintage. Our 2007 Karra Yerta Riesling remains one of our best produced yet. The wines from this ridge will continue to impress for many decades to come. I can assure you of that. Some of the special visitors that we get to the region also confirm it, but more about that in one of my next posts. Karra Yerta means red-gum country in Kaurna language (the Kaurna tribe Aboriginals used to inhabit this area before white settlement). Thus Karra Yerta describes perfectly the area we live in. Karra Yerta Wines was one of Australia's smallest wineries and produced around 350 cases of ultra-premium wine annually. We are a small family business which derived from a ten-year hobby. In 2011 we decided to wind down our business so all stock is now available at heavily discounted prices. Not much left so get on it, folks! Tweet this blog to your Twitter account, here. By Jingo! It's Australia Day - let's run for the hills! The Battle of Evermore, and of Small Business. Fear & Loathing: A Savage Journey to the Heart of the Wine Industry. No banjos but plenty of amazing wine and food at McLean's Farm. 2014 - The Best Thing. Finally, a Ray of Light! WHERE IN THE WORLD IS KARRA YERTA? This section is a collection of photographs from around the world. The common theme is drinking our wine or wearing our merchandise. Feel free to email your photo for inclusion on the page. Amanda Sullivan at home in the Barossa.